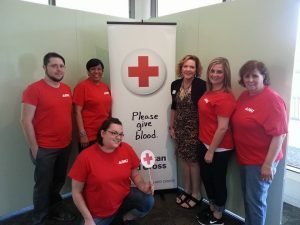 August 6, 2015 – DKI, North America’s largest disaster restoration contracting organization, today announced their participation with the American Red Cross’ 100th Anniversary in Chicagoland sponsoring the Brookfield Zoo Summer of Connections Blood Drive yesterday, August 5. Donning their red DKI Volunteer shirts, several DKI Franchise Members and corporate personnel volunteered their day at the zoo, giving blood, aiding the Red Cross where needed, and educating visitors about emergency preparation through their sponsored Red Cross Emergency mobile app. The day ended with 250 presenting donors, offering what can potentially help up to 684 patients requiring donors. DKI initially partnered with the Red Cross as its exclusive emergency preparedness sponsor for its new Emergency App, released in April, 2015. The organization looks forward to many other volunteer events with the Red Cross.